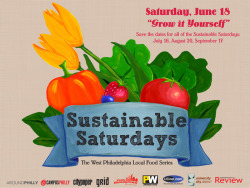 This weekend, June 18th is the kickoff event for “Sustainable Saturdays: The West Philadelphia Local Food Series,” sponsored by University City District. Throughout the summer, every third Saturday of the month there will be tours, activities, how-to workshops, and other unique ways to celebrate local and sustainable food practices in West Philly. This Saturday’s theme is “Grow it Yourself” with over 10 enticing and free events happening. The Clark Park Farmers’ Market, which is open every Saturday all year long from 10am-2pm, will have its usual array of local food. Be prepared to see the beginning of summer's produce offerings! Noon-1pm Foraging for Edible Plants at USciences Lower Mill Creek Garden: Follow expert foragers from Wild Foodies of Philly – a group of wild foods enthusiasts - on a tour of edible and medicinal plants within steps of Clark Park. Noon-1pm Creating an Urban Homestead at Farm 51: Learn about what you can and can't do in your own backyard, as well as the basics of keeping vegetables and animals in the city. Noon-1pm Irrigating with Stormwater at Walnut Hill Community Farm: Learn how Walnut Hill Community Farm is using stormwater and solar power to irrigate its crops, and how you can use similar methods to water your own garden. 1-2pm Sustainable Landscaping at Chester Avenue Community Garden: This workshop on edible landscaping by Phil Forsyth of Forsyth Gardens and the PhiladelphiaOrchard Project (POP) will showcase kitchen gardens, backyard orchards, and edible ornamental plants for the urban landscape. Take a farm-to-table trolley tour through West Philadelphia sponsored by Philly Homegrown™. Hosted by Paul Steinke of The Reading Terminal Market, the tour will make visits to Walnut Hill Community Farm, Milk & Honey, and Farm 51. Tour goers will experience urban farming, beekeeping, taste fresh foods, and hear directly from local farmers. The tour will finish at the MidAtlantic Restaurant & Tap Room for a dinner using local ingredients. $45/person. To RSVP click here. Everyone loves ice cream, so learn about the history of making ice cream in Philadelphia! After the tour, search through the garden for ingredients to hand-crank yourself a cool treat! $10/adult. Can’t make the Sustainable Saturday on June 18th? No problem, mark your calendars now for the next one, July 16, “From Farm to Table.” More information here.